If you like to make wine at home or if you collected more than 25 bottles of wine and are looking for the perfect storage space, know that investing in a quality wine cooler is probably the best solution. On the market, there is a myriad of manufacturers of household appliances that have their own lines of wine coolers, as well as manufacturers who are specialized in producing wine fridges and wine cabinets alone. From all these manufacturers, a less known brand that has very reliable wine coolers is Vissani. Below, we will let you know why you should buy a Vissani wine cooler, then our Vissani wine cooler reviews will reveal the features of each model. Why Should You Buy A Vissani Wine Cooler? For those of you who never heard of this brand, or for those who have heard but have no idea who is Vissani, know that Vissani is not an actual brand, but a trademark registered by the Homer TLC Inc. The trademark is used for a series of wine coolers and beverage coolers. Although owned by Homer TLC Inc., the actual manufacturer of the Vissani line is Magic Chef, a brand renowned for its reliable appliances which include the wine and beverage coolers. For Vissani, Magic Chef is manufacturing a line of three wine coolers with capacities between 28 and 50 bottles. 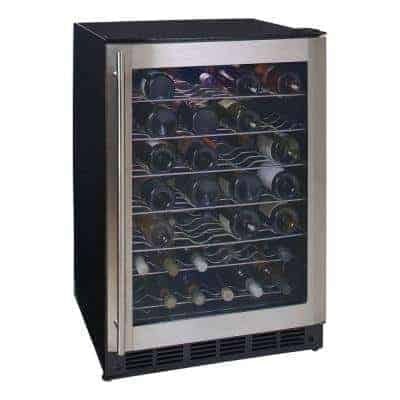 These wines coolers are ideal for all those wine enthusiasts that don’t have access to a cellar but want to keep their small-medium collection of wines in the best conditions. If you have just a few bottles but plan to add some more wines to your collection, then you should probably invest from the start in a wine cooler with a capacity of 40 bottles or more, at least that is the expert’s advice. Now that you know who is Vissani, read our Vissani wine cooler reviews to decide what unit to buy. But before, here are a few tips that should help you choose the right wine cooler for you. Choosing a wine cooler might be confusing, mainly because, in addition to the capacity, you must decide a series of other things, such as preferred cooling technology and other desired features. Type of wine cooler: depending on where you want to place the appliance, you can choose between freestanding, countertop or built-in units. The countertop units are typically made for storing up to 24 bottles of wines and many of these models are thermoelectric. The freestanding units can be either compressor or thermoelectric and can vary in capacity from 12 or 18 bottles to real cellars of 100 bottles or more. The built-in units are almost exclusively compressor. The capacities vary a lot between the various models and, in most of the cases, you can use these units either as freestanding or as built-in. Cooling system: you basically will have two choices, thermoelectric or compressor.The thermoelectric wine coolers are more appropriate to store the wine for a long period rather than for chilling it before serving. They are typically more quiet compared with the compressor wine coolers, a characteristic that makes them suitable to be placed even in the living areas.The thermoelectric systems produce virtually zero vibrations, so they do not disturb the wine’s sediment. This feature is highly desirable especially for the red wines. The downside of these wine coolers is that the cooling capabilities are limited and influenced by the external temperature. The compressor wine coolers have better cooling capabilities, being more similar to the regular refrigerators. Reaching lower temperatures, they might be more indicated to store white wine and also to chill the wine before serving. The downside is that these units produce more noise and vibrations, characteristics that might annoy you and influence the quality of your wine. Temperature zones: depending on your needs, you should choose a single zone or a dual zone wine cooler. Single zone wine coolers cool down the whole internal area at the same temperature. These wine coolers are great if you have a collection of reds or whites and need only one temperature to preserve it. Dual zone wine coolers are more versatile. They will give you the possibility to store two types of wine or to chill a few bottles before serving. All Vissani wine coolers are compressor coolers. They can be either built-in your furniture or placed anywhere in the house as freestanding units. In addition, all Vissani wine coolers are designed as single zone units. The warranty for all Vissani wine coolers is one year for the parts and labor and five years for the compressor. 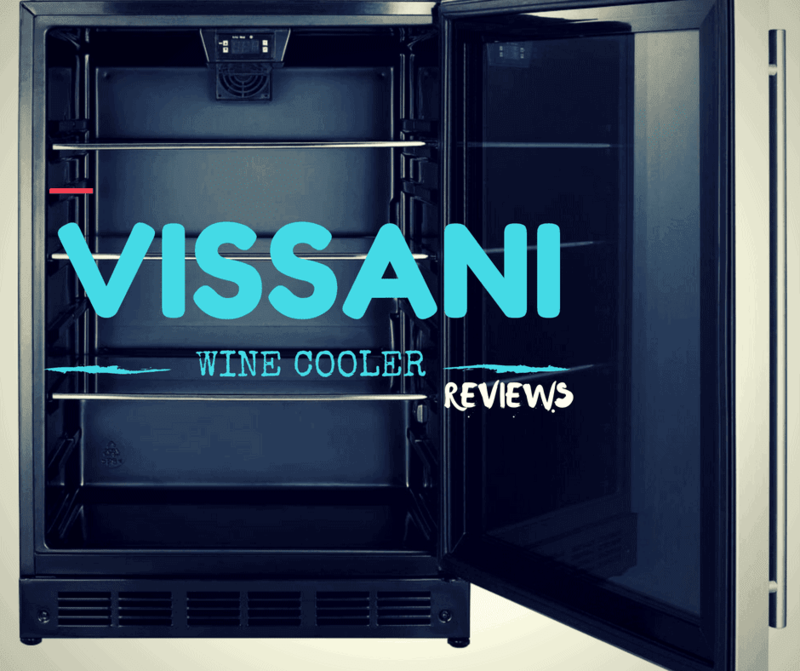 Our Vissani wine cooler reviews will describe their features in detail. Besides, we also reviewed two thermoelectric alternatives, in case you would rather prefer to invest in a thermoelectric unit. With a capacity of 28 bottles, this Vissani wine cooler impresses with its modern yet elegant design. The cooler has a black cabinet and an elegant stainless steel trimmed door. The removable wooden shelves add a further touch of class to this beautiful wine cooler. The single zone wine cooler is equipped with a manual thermostat. The temperature range is between 39 and 72°F, being perfect for all types of wine and for storage or chilling purposes. To allow you to admire your wine collection, this unit is also equipped with a soft blue internal light. Reversible door: to make this unit more versatile and to allow you to place it anywhere in the house, the manufacturer equipped it with a reversible door. Versatile storage: thanks to the removable shelves, you will be able to change the internal configuration and store larger bottles of wine. Compact size: the unit has a width of only 18.1 inches, being easy to locate it even in the narrower places. Suitable for a varied collection: it is true that white and red wines should be preserved at different temperatures, but in most cases those temperatures overlap. By setting this unit at an intermediate temperature, you will be able to preserve both reds and whites at the same time. There are some complaints about the durability of this wine cooler. A versatile solution if you want to chill or store wine and other beverages, this Vissani Magic Chef is not equipped with bottle shelves but with glass shelves. The unit is large enough to fit easily up to 44 standard 750 ml bottles of wine and has a wide temperature range between 39 and 64°F. This compressor wine/beverage cooler has a single temperature zone, so depending on your preferences you can use it to chill wine and other beverages before serving or only for storage purposes. Tempered smoked glass door: to keep your wine away from the harmful UV light, this unit is equipped with a tempered smoked glass door that is reversible. Built-in or freestanding: you can place this unit anywhere in the house as a freestanding wine cooler or built it in a cabinet if you don’t have enough space. Digital controls: setting the temperature and turning the light on and off is simple, thanks to the digital controls. Auto defrost: you will not have to worry about ice building up inside your cooler, as this unit has an auto defrost option. Not being made specifically for wines, this cooler doesn’t come with bottle racks, therefore it can be difficult to arrange the bottles inside. The last Vissani reviewed is this 50-bottle wine cooler that could be a perfect option especially if you have an increasing collection of wines. This single zone wine cooler has a temperature range between 39 and 64°F. 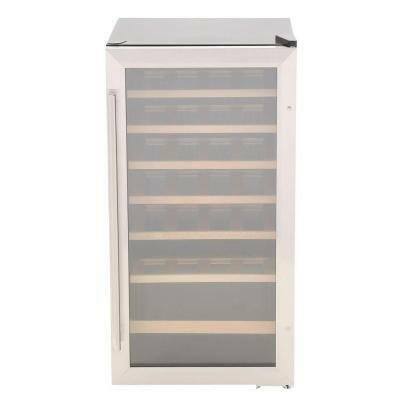 The wine cooler is equipped with five stainless steel shelves and one rack. All of them are removable, so you can personalize the internal space to fit your needs. Stylish design: the black cabinet is enhanced by the beautiful tempered smoked glass door with stainless steel details, matching any home décor. Freestanding or built-in: you can choose your preferred placing option. Digital thermostat control: it will be extremely easy to set and control the internal temperature thanks to the digital controls and thermostat. Reversible door: to match any home décor and preference, this wine cooler is equipped with a reversible door. To maintain the desired temperature, this compressor unit consumes a lot of energy. If you would like a thermoelectric wine cooler, an alternative to the Vissani wine coolers is the Whynter WC28S SNO 28 Bottle Wine Cooler. With a capacity of 28 bottles, this wine cooler is silent and has a really low level of vibrations. It is suitable for the storage of both red and white wines, the temperatures ranging from 52 to 64 degrees Fahrenheit. To give you the possibility to personalize the internal layout, this wine cooler comes with six chrome shelves that are removable. Celsius/Fahrenheit temperature display: you will be able to set the right temperature even for the foreign wines, thanks to this convenient feature. Safety lock: if you want to preserve a few expensive bottles or just keep your wine out of the reach of children, you will find this feature very useful. Soft internal light: you will be able to admire your collection or choose your wine without opening the door. External controls: to preserve your wine in the best conditions, you will be able to control the temperature without opening the door. Some users complained about the poor customer service. Another alternative if you would rather buy a thermoelectric wine cooler instead of a compressor is this wine cooler from Firebird. 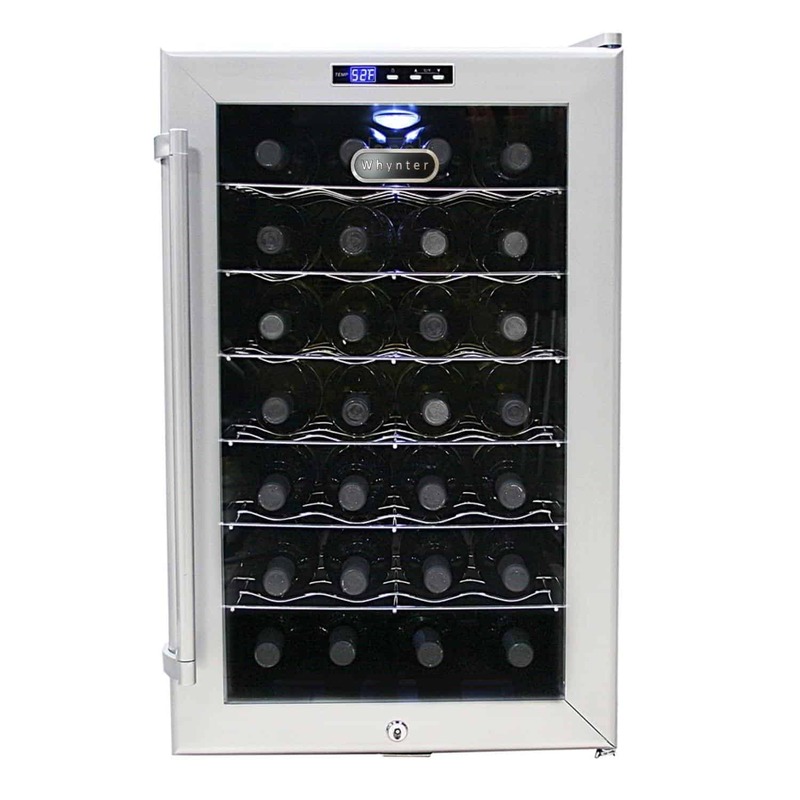 This wine cooler also has a capacity of 28 bottles and a wide range of temperatures. 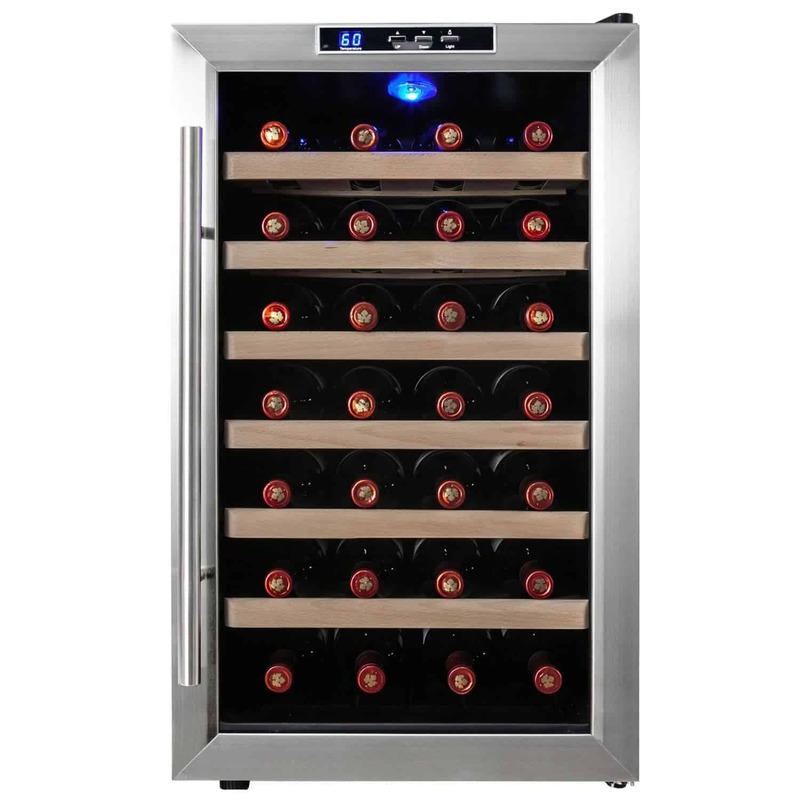 You will be able to preserve both red and white wines, the temperatures ranging between 54 and 66 degrees Fahrenheit.This unit has external digital controls and a soft internal light, while the shelves are removable to ensure a greater versatility. 6 dimension options: the manufacturer makes various versions for this wine cooler, with capacities between six and 32 bottles. Elegant design: the wine cooler has a sleek design and is fitted with elegant wooden shelves to match any interior. Simple controls: setting the temperature or turning the light on and off is simple thanks to the intuitive controls. Very quiet: this wine cooler has a really quiet operation, so you can place it anywhere in your house. Because of its compact dimensions it might be difficult to fit in all the 28 bottles. As these Vissani wine cooler reviews show, if you want a compressor wine cooler with a capacity between 28 and 50 bottles, you can find the right Vissani wine cooler for you. Alternatively, you can choose one of the two thermoelectric wine coolers presented. However, our favorite wine cooler is the Vissani 50-Bottle Wine Cooler. 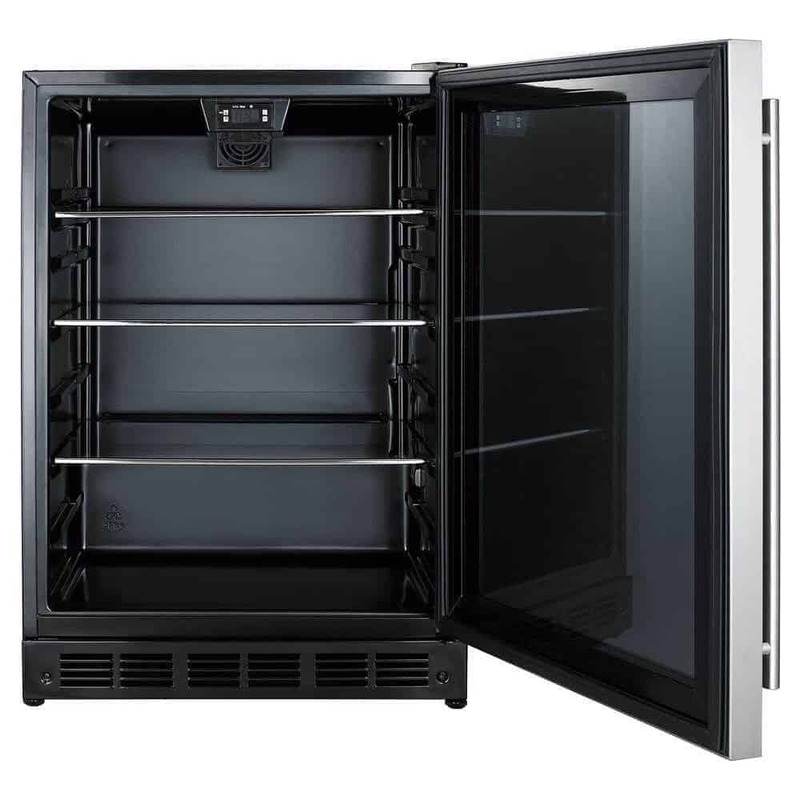 We like this wine cooler because it has a wide temperature range, it has five removable shelves and one removable rack and you can easily accommodate even the larger bottles of wine. The compressor will maintain the temperature better than a thermoelectric system and the digital thermostat and controls will allow you to set and control the temperature with ease. We also like the design and, above all, the reversible door. For all these reasons, we consider the Vissani 50-Bottle Wine Cooler the best Vissani wine cooler available on the market.